“This is the first of several milestones over the next 10 months that mark the halfway points in our journey to the solar system’s frontier, where Pluto lies. We on the mission team know we will have a long way to go, but are proud to have brought the spacecraft to this important mile marker in our journey across the entirety of our solar system,” says New Horizons Principal Investigator Alan Stern, of the Southwest Research Institute. 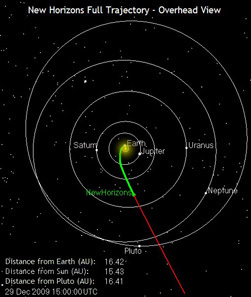 Nearly four years after lifting off from Cape Canaveral Air Force Station, Fla., on Jan. 19, 2006, the speedy probe is now approximately 1.527 billion miles (2.463 billion kilometers) from Earth – and 1.526 billion miles (nearly 2.462 billion kilometers) from the Pluto system. The spacecraft is just a little past halfway between the orbits of giant planets Saturn and Uranus, getting closer to Pluto at the rate of about 750,000 miles (1.2 million kilometers) per day. 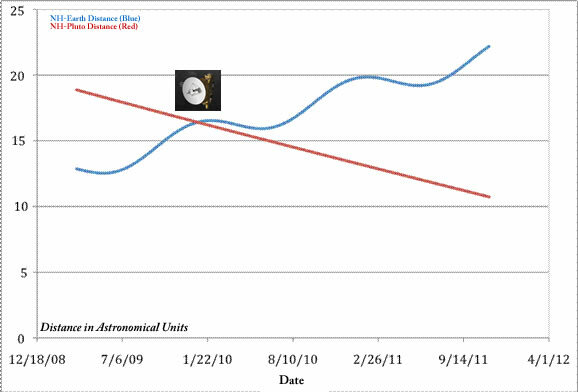 But closest approach to Pluto is still just over 5½ years away, on July 14, 2015. New Horizons continues operating normally ­in hibernation , collecting interplanetary dust impact data as it flies on. The operations team at the Johns Hopkins University Applied Physics Lab in Laurel, Md., plans to wake the craft on Jan. 5 for 10 days of light maintenance and tracking activities; a longer and far more intensive wakeup is planned for next summer. On Feb. 25, 2010, it will have covered half the heliocentric distance to Pluto from its launch at Earth. On April 20, 2010, it will be half as far from the Sun as Pluto will be at the time of the encounter on July 14, 2015. On Oct. 17, 2010, it will have traveled half the flight time to reach Pluto. 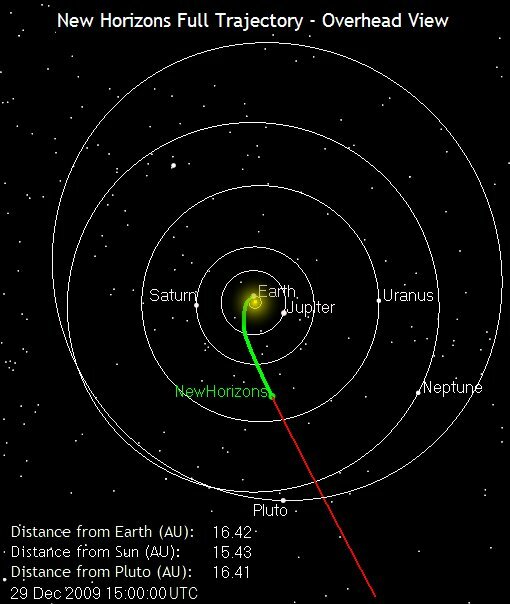 This chart shows the distance of New Horizons to both Earth and Pluto. The "wiggle" in the blue line is due to Earth's changing position around the Sun.